EGi continuously researches sales, lettings and auction transactions across the UK, with around 58,000 new deals added throughout the year. Conduct valuations faster, qualify potential investments and track market activity with EGi Deals. EXTENSIVELY RESEARCHED: EGi works with local agents and all auction houses to provide a comprehensive comparables database with transaction details you won’t find anywhere else. 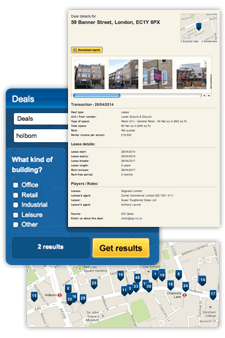 RELEVANT: Search data by transaction type, size, date, rental cost, sale price or company name. TIMELY: Receive details of new deals matching your requirements via email alert. FLEXIBLE: Export properties to Excel to analyse offline or Word to easily present and share with clients. RELIABLE: Data is researched by Estates Gazette, part of a FTSE 100 company, and provider of commercial property information for over 150 years. See how EGi commercial property deals can help grow your business and make informed decisions with a free trial. Simply register your details and we’ll get you started. rely on EGi to help grow their business and make informed decisions. EGi’s Availability enables me to put together a comprehensive schedule of vacant property that match my clients’ space requirements and the Deals database is a critical tool in helping me carry out rent reviews and lease renewals in a time efficient manner.